By refocusing our space program on Mars for America’s future, we can restore the sense of wonder and adventure in space exploration that we knew in the summer of 1969. We won the moon race; now it’s time for us to live and work on Mars, first on its moons and then on its surface. I believe that every human has a finite number of heart-beats. I don’t intend to waste any of mine running around doing exercises. Exploration is wired into our brains. If we can see the horizon, we want to know what’s beyond. Buzz Aldrin, Esquire, January 2003. Buzz Aldrin (born Edwin Eugene Aldrin, Jr.; January 20, 1930) is an American engineer and former astronaut, and the second person to walk on the Moon. He was the Lunar Module Pilot on Apollo 11, the first manned lunar landing in history. He set foot on the Moon at 03:15:16 (UTC) on July 21, 1969, following mission commander Neil Armstrong. He is also a former U.S. Air Force officer and a Command Pilot. 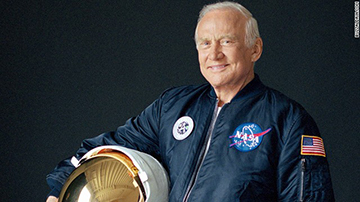 Buzz Aldrin is an Explorer. Buzz Aldrin is an Intellectual. Buzz Aldrin is a Visionary.